Anita Avedian was born in Beirut and lived in Istanbul, as well as London until 1981 when she moved to California with her family and attended an Armenian school to preserve her culture. In 1995, Anita received her Bachelor of Arts degree in Psychology from the California State University of Northridge (CSUN). In 1998, she received her Master of Science degree in Educational Psychology from CSUN with an emphasis on Marriage, Family and Child Counseling. She also incorporated her interest in serving private sector business entities that covered a wide range of industries including government agencies. Upon graduation, she had completed two Master’s level certifications: 1) Human Resources (Consulting, and Organizational Development); and 2) Employee Assistance Program (EAP). Anita began her first internship with Jewish Family Services: Family Violence Project. She worked in a battered woman’s shelter where she assembled many children and teen groups focusing on anger management and trauma work. During those same years, Anita also participated in an internship as an internal EAP at Glendale Adventist Medical Center (GAMC). She coordinated and facilitated workshops in Assertive Communication for the employees of GAMC. Another internship included the Training and Development department of Guess Corporation, where Anita worked closely with training staff and management at various departments. Concurrently, Anita worked at UCLA, Center for Community Health, for 5 years, where she was an Intervention Coordinator for two different research projects studying the efficacy of structured counseling programs for HIV positive teens and adults. Continuing education is important for Anita. As such, she became certified in conducting Critical Incident Stress Debriefing, Anger Management, Domestic Violence, Thought Field Therapy (TFT) and Emotional Freedom Technique (EFT). In 2001, Anita began her private practice in Tarzana and Bel-Air. As her practice grew, she opened an office in Sherman Oaks. In 2003, Anita began facilitating Anger Management classes and with her partner, Laurie Brumfield, incorporated ABC Centers for Self-Improvement. In 2005 Anita continued her work with anger management renaming the company Anger Management 818. Currently, there are 16 anger management counselors for Anger Management 818, with 10 locations. Working as an external EAP for many years, Anita gained additional experience with providing assessment, referral, counseling services, workshops, including team building and skill training to company employees. From 2009-2011, Anita worked with Kaiser Permanente as a Physician and Employee Assistance Program Coordinator. As the internal EAP, Anita worked with many departments, managers, and employees. She offered consulting to management, problem solving to employees and physicians, assessments and appropriate referrals. Comfortable on camera and dealing with issues in popular culture, Anita has worked on several reality shows, including the Bad Girls Club, Sunset Tan, and Little Women of L.A. She was also a panelist for CSUN’s On Point discussing My Space and teens. Anita has been on several radio shows including Hot Mom’s Club, The Wacky Wonderful World of Relationships, and Shrink Rap. Additional shows include My Health show, hosted by the Armenian American Medical Society of California, giving pointers to couples for keeping the love alive, and Medicine Today discussing Domestic Violence in Armenian. Recently, she published a webinar about Digital Marketing for Therapists. Presentations and trainings became another part of Anita’s business. Starting in 2010, she was the only MFT presenting at the First Annual West Coast Symposium of Addictive Disorders in La Quinta, California, hosted by C4 Recovery Solutions. The Armenian American Medical Society invited her to speak twice at their annual conference in Vegas (2013 and 2014). In 2013 and 2015 she presented at the State CAMFT Leadership Conference to help Chapters obtain sponsorships. Additionally, she has presented at AYARN, City of Burbank, Kaiser Permanente, SFV-CAMFT, SGV–CAMFT, and SFV-EAPA. She contributes 3 times annually in the 40-hour Domestic Violence Victim’s training with the Jewish Family Services- Family Violence Project, and presents on Treating the Angry Client. In 2011, Anita realized there was a need to standardize the practices in the Anger Management field. The California Association of Anger Management Providers (CAAMP) was co-founded by Anita, which is currently the California Chapter of the National Anger Management Association (NAMA). 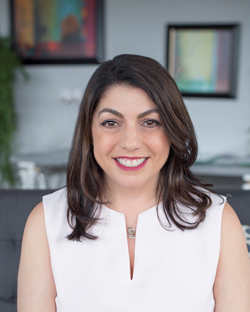 Anita has chaired the CAAMP annual conference three times to date, inviting legal professionals including attorneys and judges, and well known therapists to share their expertise with the anger management treatment community. In 2013, after attending several Toastmasters meetings for polishing public speaking skills, Anita founded Toastmasters for Mental Health Professionals. In that same year, she began Anger Management Essentials, where she holds monthly anger management certification training throughout California, Nevada, and sometimes other states and countries. In 2015, Anita authored and published, Anger Management Essentials, a workbook with over 50 lesson plans. It was translated into Armenian, Spanish, and Hebrew. The book has a teen’s version that was published in 2017, which was co-authored with Ingrid Caswell, LMFT. Another passion Anita holds is networking, and helping the therapy community grow. As such, she’s involved with the local chapters of Employee Assistance Professional Association (EAPA), California Association of Marriage and Family Therapists (CAMFT), Armenian American Mental Health Association (AAMHA), Toastmasters for Mental Health Professionals, the Armenian American Medical Society (AAMS), and Glendale Area of Mental Health Professionals Association (GAMHPA). Anita oversees the mental health segment of the Annual Glendale Health Festival, and coordinates many volunteers to provide consultation, referrals, and education on mental health to the community in need. Currently, Anita has 5 offices: Glendale, Beverly Hills, Woodland Hills, and two in Sherman Oaks. Anita finds her work in the various fields and populations successful and professionally rewarding.